Solar Panels are great – they allow us to put charge back into our batteries no matter where we happen to go. No doubt you’ve also realised that with panels there’s a major choice to be made – put them on the roof or have them portable. On the roof they’re secure and I don’t have any set-up to do, but if I park in the shade they don’t get sun, so very little charge goes into my batteries. That’s where portable solar panels are great – ‘van in the shade, panels in the sun – all good! There is of course the risk they’ll go walk-about, but I’m sure you’ll have some schemes up your sleeve to deal with that. Some campers like to have a combination of both portable and fixed – that way we can cover both possibilities. 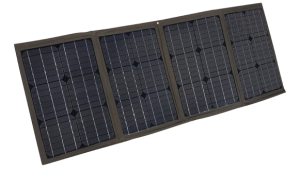 So let’s say we’ve decided on some portable solar – what do I look for? Well let’s start with some different types, and then we’ll come to The Most Important Thing about Portable Panels later on. This is basically a single solar panel with an aluminium frame that is not fixed or tied down to anything. It may come with a regulator and leads to connect it to the battery, or it may be sold without one and feed into a DC-DC charger or existing regulator which will control the charging. These are definitely the simplest and cheapest option and are ideal if the panel size and packing space is not too much of an issue. For instance with a camper-trailer, to travel we can just put them flat on the bed, throw some blankets and pillows on top, and fold it all up – simple. This is probably the most common type of portable solar panel. It’s basically two panels of the same size that have their aluminium frames hinged together – that way they can they can fold into half the size while we’re travelling. There will also be some sort of arm attached, which swings out so it can stand by itself. Most times they will also have a regulator and battery leads included, and a protective carry-case. These come in all shapes and sizes and some are even tri-fold with three panels hinged to each other. The cost is a step up from the single panel but their compact size makes them much more convenient when travelling. Most solar panels consist of a hardened-glass panel inside an aluminium frame. The canvas-framed folding panels do away with the metal frame and have the panels protected and hinged inside a canvas frame. These are typically tri-fold or quad-fold panels, and they have two main advantages over the metal-framed versions. Firstly they are much lighter – for instance a 120W model weighs just 7kg, compared to around 12kg for a 120W folding panel with aluminium frames, so nearly half the weight. And even the 180W model in canvas-frame weighs only 8.3kg. 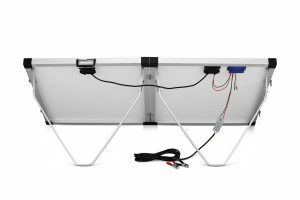 Secondly, because they have 3 or 4 panels, they fold up much smaller – so if packing space is at a premium in your setup, then this type of portable panel might well make a lot of sense. 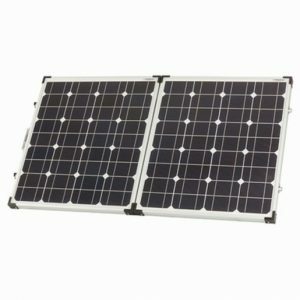 These are a variation of the canvas-framed portable panels above, with the added innovation that the solar panel itself is now made of a flexible plastic. 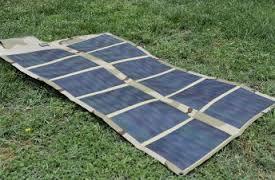 This makes the solar blankets even lighter than the canvas-framed ones, and a 115W panel weighs in at a mere 4.5kg. They are also multi-fold which means that they compact down really well and will take up very little packing space. There’s only one downside – yep, you guessed it – the price is a good bit more than the glass panels. But hey, it’s another option out there, and it may well suit your particular situation. So we have 4 types to choose from, and heaps of different brands. The general rule is: you-get-what-you-pay-for, although there are some good quality bargains to be had out there, so it pays to do your homework carefully. Now to The Most Important Thing – either for portable solar panels that you’ve bought, or ones that you’re intending to buy. If the panel is supplied with a regulator – where is that regulator? If it’s at the battery-end of things, all good – being close to the battery, there will be minimal volt-drop from the regulator to the battery, and the regulator can do its job properly – great! However if the regulator’s at the back of the panel, we have a case of “oh dear!” – all is not lost, and we can remedy it, but there are two reasons that it’s a really bad idea to have the regulator at the back of the panel. Regulator on Back of Panel – Not Good! First, it gets hot there! And the electronics inside the regulator doesn’t like heat. Some regulators will start to drop back their output when they get hot – that way they can survive. But that’s not good news for our battery because now it won’t get the full output from the panels. The cheaper regulators will just burn out – yep, seen enough of those on the back of a panel to know it’s not that uncommon either. And when they burn out they can either go open-circuit, and we get zero output to the battery – or they can go short-circuit and just flog the battery with all the power the panels can give. None of the above are great alternatives, right? And the second reason it’s a bad idea for the regulator to be at the back of the panels, is that it’s far from the batteries and we get the dreaded volt-drop. The regulator is there to look after the batteries, not the solar panel, and it drops the 18Volts or so from the panel down to the battery-voltage of around 12 to 13 Volts. So after the regulator has dropped down the voltage, the voltage will now drop even further on its long way to the battery, especially if the manufacturer has “economised” on the cable – in some cases I’ve seen it as bad as 2Volts lost. This volt-drop means the battery will get only a fraction of the power that the panels can give. Also the regulator can’t sense the battery correctly with all that volt-drop, so it thinks the battery is full when it’s not – again, it’s just not going to charge the battery properly at all. First possibility is the regulator is not glued to the panel – this is the good alternative, and we’re in luck. In this case we can simply disconnect the regulator out of the circuit, and reconnect it close to the battery, preferably within a metre or two. Now if that 18Volts from the panels drops by a volt or two along the cable, it still arrives at the regulator with 16Volts or more, and the regulator still has plenty to play with, and it can drop that down to battery voltage at 12 or even 14Volts. And being close to the battery it can sense when it’s flat or if it’s reaching full charge. So just by moving the regulator close to the battery – problem solved! The not-so-good possibility is the regulator is glued to the panel. I’ve seen panels cracked by trying to prise the regulator loose – if you try it, be ready to back-off just before that happens… ask me, I’ve tried it, and it’s a nervous business. So getting the regulator off the panel and relocating it near the battery is the one option. The result is similar to the previous case – much better! The other option is to simply leave the regulator stuck there and disconnect it. Buy yourself a decent PWM regulator, and run the cable direct from the panel all the way to the new regulator, which you can locate near to the battery. A bit more effort and expense, but if it’s been stuck on then chances are it isn’t that good a regulator anyway. For more on PWM & MPPT regulators have a look at Solar Panels & Regulators. Finally, if you really want to (or have to) leave the regulator where it is, the last option is to increase the cable size from the regulator to the battery. This will reduce the volt-drop from the regulator to the battery, but the cable needs to be big – really big – because we need to keep the volt-drop down below 0.2Volts. For a 10 metre run and 10 Amps charging current we are looking at a 14mm twin cable (6B&S) at least – might be a good idea to price it up before going down that route. To calculate volt-drop have a look at Volt-drop in Cables or the Volt-drop Calculator itself. Anyway, the good news is that relocating the regulator typically results in one of those “oh wow!” moments – the difference in charging power when moving the regulator close to the battery is really impressive – in short you are getting all the solar power you paid for. 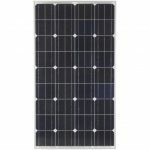 So that’s it – heaps of variations for us to choose from when looking at portable solar panels – and some ways to remedy things so that we get all the solar power we’ve paid for. Thank you for the 12 volt blog, an invaluable source of information and though provoking reading on what is a step to being self sufficient while enjoying this big brown land. I read of the delema re regulators stuck to the backs of panels. I felt compelled to offer a tip. I have successfully cut two such regulators off the back of two (rather well known brand too) panels using a sharpened metal egg flip/spatula, and will do a third when it arrives. It is not easy and time consuming, but the flexible blade allows you to cut between the panel and regulator rather than ‘prize’ it off with no damage. Yep, our wide brown land – and being self-sufficient means we slowly make it greener by not using up any more resources – how good is that! Thanks for that tip with the egg spatula – nice one! – and putting that regulator where it belongs really pays off power-wise, so the “not easy and time-consuming” task becomes worthwhile. Your series of post about solar panel are great mate. This is the future, Australia has a huge potential because of our sunny weather. I am having a ranger and looking forward to use portable solar panel for our a week journey. Power source is a big issues for us, need to have one. Need more guidance on how to maximize space and to install it. What sort of 12Volt stuff are you planning to take on your journey? That will determine how much solar and battery power you’ll need. Let me know and we can work it out. Had the blog bookmarked for a while and have been waiting to have time to get into it. First post i’ve read and already proven invaluable, my panel has the regulator right there on the back. Can’t wait to see all the other tips I can learn. Glad the info is proving useful, and thanks for the positive comments!